Starting in April 1945 during the Battle of Okinawa, special (suicide) attack pilots made sorties in Type 4 Hayate fighters from the east and west airfields of Miyakonojō Army Air Base. Between April 6 and July 1, 79 pilots in the Shinbu Corps  flew Hayate fighters on special attacks. Nearly all of these pilots were from 18 to 23 years old. 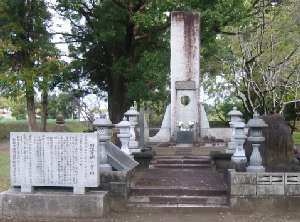 Miyakonojō City erected the Hayate Shinbu Special Attack Corps Monument in November 1977 in Miyakojima Park. The park also has six other monuments and a building built in 1938 at the Army Base to house the ashes of the war dead. In April 1945, the offensive and defensive battle for Okinawa, which determined the fate of Japan, became especially grim and savage. Special attack planes with bombs and fuel for one way took off one after another day and night from Army and Navy air bases in southern Kyushu. At that time an East Airfield and a West Airfield were located on the outskirts of the city. In April 1945, Type 4 Hayate fighters serving as special attack planes took off from this base for the first time to southern skies toward targets near Okinawa. After that time until July 1, 17 sorties took place. Believing in success in war and victory for the country, young Special Attack Corps members, about 20 years old still with faces of boys, died for our country in far-off southern seas. With the passing of 32 years since the end of the war, no reminders remain of those days as the entire base has changed in appearance. Approaching the 33rd anniversary of their deaths, an opportunity arose for bereaved families of corps members to erect a monument in remembrance of them. This year in June a support committee was formed with the mayor serving as chairman. Fortunately, considerable contributions were collected from near and far. Filled with hopes for eternal peace, we here remember together the spirits of both Special Attack Corps members and other men related to the base who gave their lives for our country. A stone tablet directly to the left of the main monument has inscribed the names, ages, Shinbu squadron numbers, and sortie dates of the 79 Hayate pilots who died. In order to forever acclaim the distinguished deeds of the Miyakonojō Hayate Shinbu Corps members and the eagles connected to this base who gave their lives for our country, the Army Academy 57th Class Association erects here a pair of stone lanterns and a monument to their spirits. Miyakonojō Historical Museum is located in Shiroyama Park about a half kilometer south of the monument. This museum has an exhibit related to the Hayate Shinbu Special Attack Corps, but most of the museum displays relate to the Shimazu clan, which ruled the city until the late 19th century. The monument and museum are both about a 15-minute walk from Nishi Miyakonojō Station. 1. The 1st Shinbu Squadron with 10 pilots carried out the first special (suicide) attack from Miyakonojō on April 6, 1945. The 180th Shinbu Squadron with 2 pilots made the last attack from Miyakonojō on July 1, 1945. The other Shinbu Squadrons that made attacks from Miyakonojō are the following (number of pilots in parentheses): 26th (4), 27th (6), 57th (11), 58th (11), 59th (9), 60th (10), 61st (11), and 179th (5). Other Shinbu Squadrons sortied from other Army air bases in southern Kyushu such as Chiran and Bansei.